My goal is to use entertainment as a means to inspire others and then provide the tools needed to keep them motivated. With recent appearances on Access Hollywood and in Parade Magazine, how does Comic Hypnotist Rich Guzzi plan to keep the momentum going? How about a nation wide 300 show comedy tour to prepare for the one hour special he is developing! 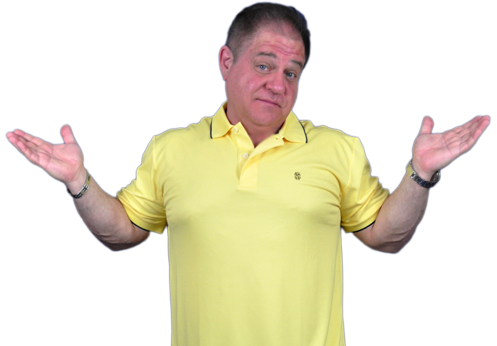 Rich Guzzi is a comedian that does hypnosis, not a hypnotist that does comedy; that is what ultimately sets his show apart from others. At any given time, Rich can take an already hilarious situation happening on stage and turn it into an unforgettable moment. Hypnotizing a group of audience members and being able to have them act outrageously is one thing, but making the scenarios create a storyline that produces outright hysteria is another, all created with new audience members every night making each show a unique experience. Every night Rich performs a high wire act. Bringing audience volunteers to the stage and then hypnotizing them right before your eyes. He doesn’t even dim the lights because he wants everybody in attendance to see the induction process. Once hypnotized, he then puts them into some of the most outrageously funny scenarios you could possibly imagine, obviously to the delight of the friends left in the crowd watching in disbelief. Interestingly enough though, believing is exactly what Rich wants to accomplish with his show every night. You see, its not enough for Guzzi to just make you laugh really hard. He wants to have every person leave that showroom knowing that Hypnosis is real. Not some spooky witch doctor trick. By showing the true benefits, he can hopefully take the stigma away, give it wide spread acceptance and bring it to the masses. “Hypnosis should be cool, not scary”, says Rich. Always grateful for what he has, Rich likes to give back with his charity of choice being animal shelters, doing benefit shows across the country. He lives in Nashville, Tennessee where his neighbors still think he is in the witness protection program. While working on the road, Rich travels with both his dog Jasper and the Baby Kitty, so to say he is a pet lover is quite the understatement. He does benefit shows across the country for animal shelters with all the proceeds going directly to the charity. He never takes one dime for the performance. Want to get involved? Work at or know an animal group that can use some financial support? Being part of the effort is easy. Just look at my schedule here and pick a date either before or after my arrival into your town and I will do the show for free. That’s it. Luckily, Rich used to be an auto mechanic and is extremely handy with tools so he can do the never ending construction and maintenance projects around his house. Which happens to be a log cabin that sits on over seven acres with a river in Nashville, TN. Thinking he might want to be a movie star, Rich moved his home base to Los Angeles for a little over two years. He was home 35 & 28 days respectively because of his ridiculous tour schedule. Eventually he sold his car, put his stuff in storage and lived on the road for almost another three years before settling in Tennessee. Always the entertainer, Rich played guitar in a band and after getting tired of carrying heavy amps around to gigs decided he liked doing stand up comedy better. He was a touring headliner for almost 10 years doing straight stand up before doing his first hypnosis show in Muskegon, Michigan. Rich recently found out that he has numerous food allergies; most of the items on the stay-away-from list are fattening and tasty. Armed with this new info, he has entered into the world of health & fitness including cardio work, lifting weights with a personal trainer, and even doing yoga twice a week to increase his flexibility. 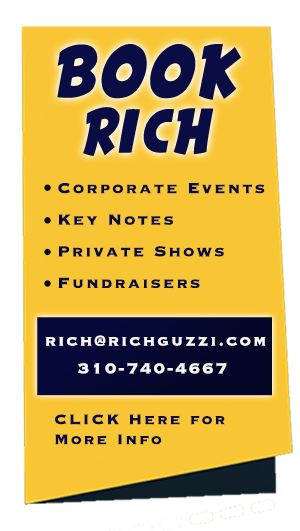 See the article about Rich Guzzi in Parade Magazine. Comic hypnotist Rich Guzzi is on a mission to get 100,000 people to quit their smoking addiction. Rich Guzzi hypnotizes Randall to do some goofy things as well as quit smoking on the John Boy & Billy Big Show. Rich Guzzi Hypnotizes Host on Morning Show in Jacksonville. When he wakes up he’s in a fog. Rich Guzzi takes hypnosis in a hilarious and helpful direction. Rich talks about hypnosis and his shows at Stitches Comedy Club in Lancaster. Comedian Hypnotist Rich Guzzi brought his comedy and his hypnotizing talents to The Hampton Roads Show and talking about the shows at The Funny Bone.